Kemal Ankaç, Detail #12 (2015), “Cultural Massacre” series. Art Rooms, Kyrenia. Courtesy of Art Rooms. Art Rooms, Kyrenia presents a solo exhibition by Cypriot artist Kemal Ankaç, featuring the extensive project KÜLTÜRKIRIM (CULTURAL MASSACRE). Curated by Basak Senova, the exhibition embraces installations, prints, objects and drawings. Furthermore, the exhibition is accompanied with a specifically designed library and a reading room, covering the recent history of Cyprus and the affiliated sketches of the artist, including a video-interview made expressly for the exhibition. The exhibition is the result of an ongoing research and work that began with drawings and sketches in 2002. Ankaç has been questioning the relations between identity politics and the mechanisms of systematic collective memory (re)constructing processes by navigating through the apparatus of war, cultural objects and a set of values and definitions that have been imposed by different governing power nodes. In this respect, with the extensive accumulation of works, Kemal Ankaç focuses on the notion of “cultural massacre” in Cyprus with the brutal governance of nationalism and fascism that was nurtured by imperialism. Deriving from his personal stories and accounts, he makes visual statements that work with symbolism and paradoxical situations, which have been normalised in the un-resting political situations, including the prolonged cease-fire status for the last 41 years. 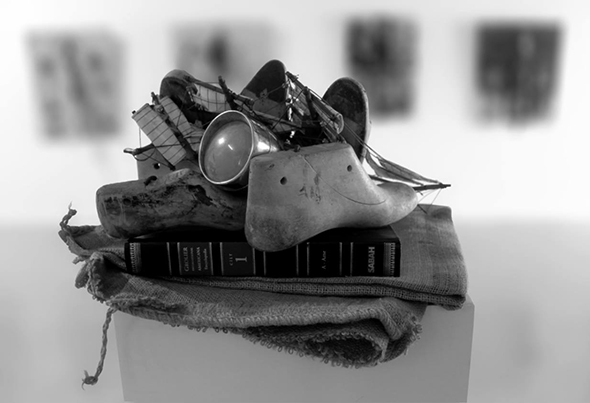 By incorporating objects of war and daily life, his installations suggest a resistance against nationalism and fascism. A bilingual book, edited by Basak Senova and published by Art Rooms, will be launched during the opening of the exhibition. The book gathers Ankaç’s works, research, discussions and ideas, accompanied by critical reflections by authors such as Jenan Selçuk, Stephanie Bailey, R. Halluma, Oya Silbery and Basak Senova. Kemal Ankaç (b. 1962, Limassol, Cyprus) studied painting at Mimar Sinan University in Istanbul. After completing his studies in Turkey, he returned to Cyprus in 1987 and focused largely on anti-war themes by using predominantly drawing and painting. Together with a group of artists, he put his signature under a “contemporary manifesto” and became the co-founder of the Fluxus Group in Cyprus in 1988. After the group disbanded he worked independently and began to process issues stemming from the psychology of “imprisonment and being sieged” as the outcome of the ongoing political situation in Cyprus. His works have frequently been exhibited internationally both in group and solo shows in Cyprus, Turkey and the UK. Ankaç lives and works in Cyprus. For further inquiries about the book launch and the exhibition please contact artrooms@arkingroup.com.